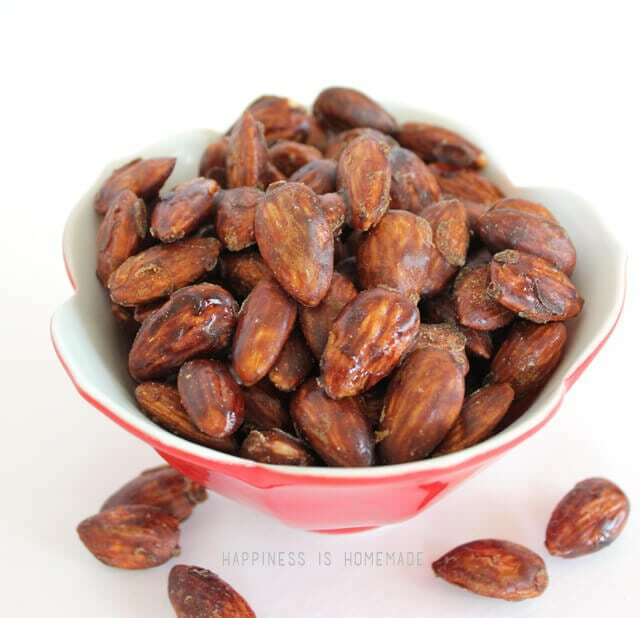 Paleo Caramelized Cinnamon Almonds – Refined Sugar Free! I think I need to start off with a warning: these Paleo-friendly caramelized cinnamon almonds are highly addictive. Insanely addictive, even. They have just the right amount of sweetness without being overly sweet, and the spice of the cinnamon is in perfect proportion. You’ll tell yourself that you’re just going to eat a few, but in the end you’ll realize that you’ve polished off an entire handful or two. Or three, but who’s counting? The secret to their ideal sweetness is using coconut sugar instead of refined white sugar. Coconut sugar can be used as a 1:1 substitute for white sugar, but it has a much lower glycemic index, so it’s considered safe for diabetics. It’s also packed full of potassium, magnesium, zinc, iron and B-vitamins, so it’s far more nutrient rich than other sugar substitutes. Coconut sugar is not overtly sweet, nor does it taste like coconut, but is reminiscent of brown sugar with a subtle caramel flavor – perfect for caramelizing! 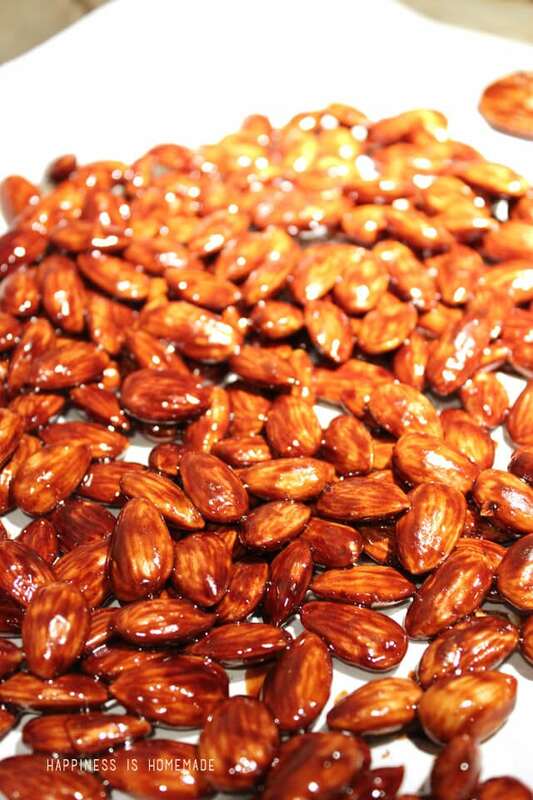 To make these caramelized cinnamon almonds, stir together 1 cup of coconut sugar, 1/4 cup water, 1/2 tsp. cinnamon, and 3 cups of almonds. Heat over medium heat and continue to boil for about 5-10 minutes, stirring constantly, until the liquid begins to lightly crystallize on the almonds. Pour almonds on to a parchment paper lined baking sheet and allow to cool. Break apart any large pieces that are stuck together, and enjoy! 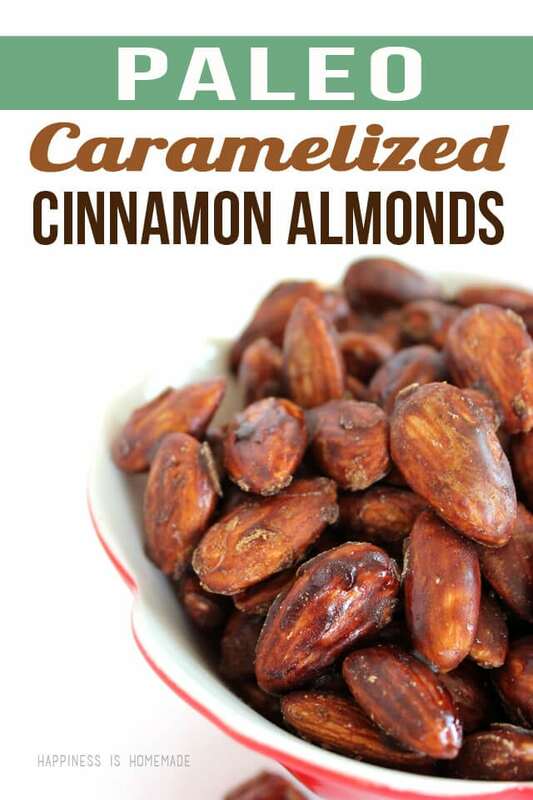 These almonds are one of my favorite snacks right now, and I could eat them alllllll day long! My boys are hooked, too, and I don’t have to feel badly about loading them up on refined sugar when they start begging for these at dessert time. 4 simple ingredients + 10 minutes = AMAZING healthy goodness! Can’t beat that! Ohhhh myyyy goodness, I need to have these right now! 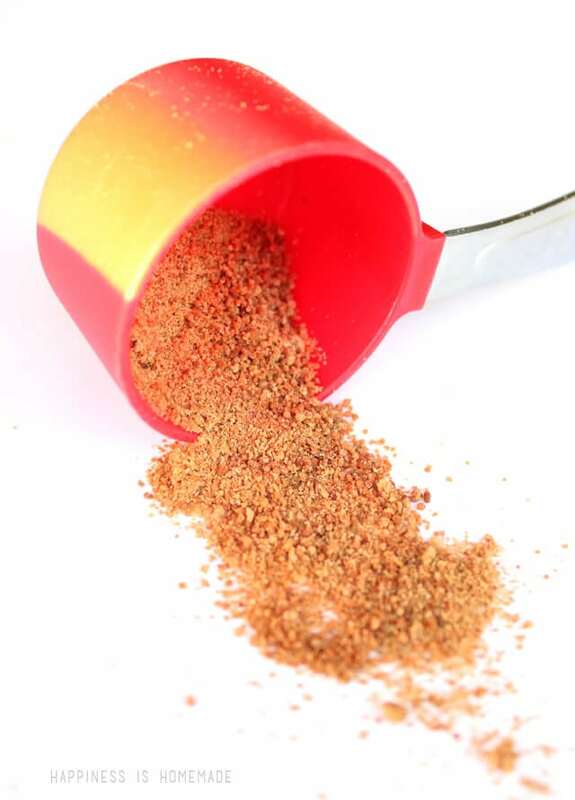 I have never used coconut sugar, is it easy to find? I love me some almonds, and sugar, so these sound like a perfect match. 🙂 Thanks for the recipe, pinning!! Oh my word, that looks delicious! I’m going to have to see if I can find the coconut sugar at my grocery store. I picked up a bag of Simply Balanced organic coconut palm sugar at Target. I was so thrilled to find it so easily. 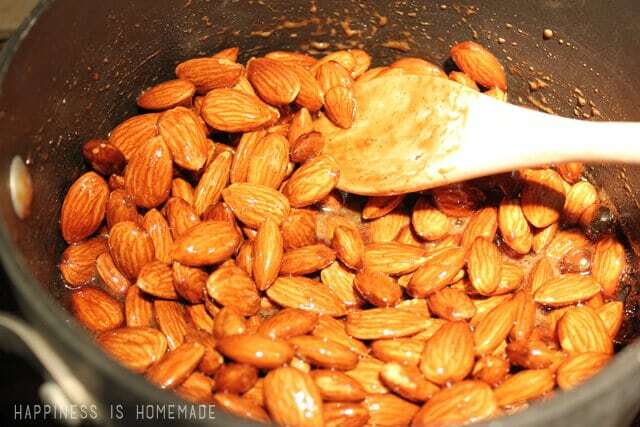 I’m making a batch of almonds right now! What kind of almonds do you use? I used Blue Diamond Whole Natural and they are not as crunchy as I expected think I might roast them first next time. I attempted to make these they look like something that would be great to take to the office this holiday. My problem is they will not dry. What am I doing incorrectly? Hi Becky, my only thought is that you might not be cooking the sugar for long enough. If it doesn’t reach the correct temperature it won’t be able to crystallize/solidify (much like candymaking), and the sugar solution will stay wet. 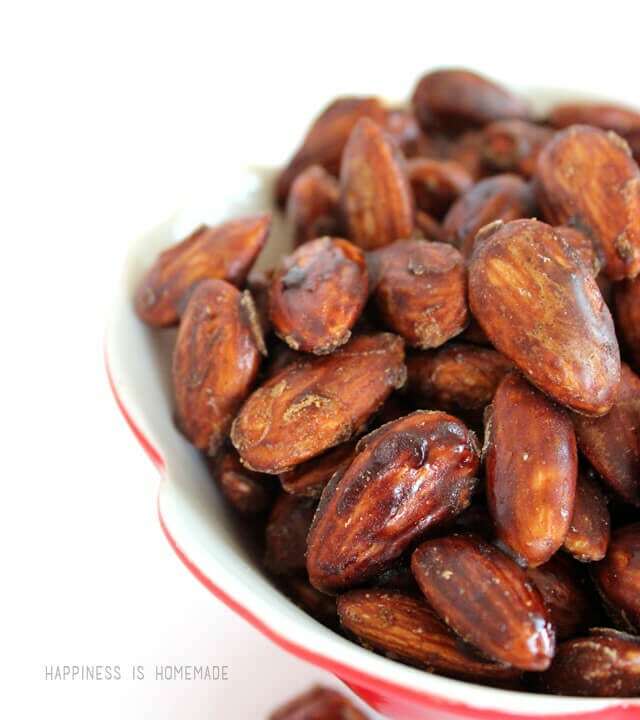 DO you use raw or dry roasted almonds? I just made these but added a little nutmeg and a pinch of sea salt and they are the best thing I have ever eaten. Guess what everyone’s getting for Christmas this year! Thank you so much for the recipe! could you use Pecans instead? Do you think I could do these with cocoa instead of cinnamon? Would the cocoa burn? I just did them without the cinnamon, and when they were ready to cool, tossed them with cocoa. Looks so pretty, and tastes just like hot chocolate. Can u make this recipe ahead and store in mason jars for gifting? I have a diabetic neighbor that would love these for Christmas.